I.E.S. Diffusers are white glass reflectors found on floor and table lamps, and are often used to support a fabric shade. Floor models often have an oversized light bulb in the center, which may be surrounded by three smaller candle-type bulbs. IES stands for the Illuminating Engineering Society, which has defined a file format for describing the distribution of light from a light source. For other floor lamps, check the TORCHIERES FOR NEW LAMPS and TORCHIERES FOR OLDER LAMPS categories. 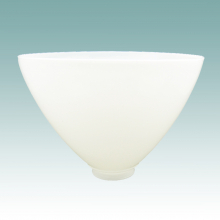 #1129 - Smooth White Diffuser 6"
#1130 - White IES Diffuser 6"
#1128 - Smooth White Diffuser 8"
#1131 - White IES Diffuser 8"
#1137 - Glass Shade 8"
#1138 S - Glass Shade 8"
#1132 - White IES Diffuser 10"
#1136 S - Glass Shade 10"